Chanteur Country Canadien né Robert George King le 6 Janvier 1934 à Joyceville (Ontario). Il est décédé en 1989. 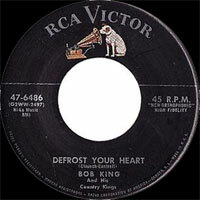 A native of Ontario, Canada, Bob King was raised in the Ottawa Valley, a little-known "down north" center of country music and hillbilly culture. King came close (without quite succeeding) to breaking into the American market and achieving lasting fame beyond the confines of rural Ontario. He had major hits in Canada, and a small following in the United States without ever finding substantial success there. 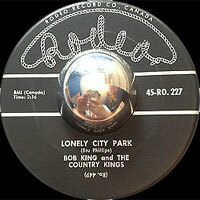 Bob King was born to a British mother and a Canadian father on January 6, 1934. His father abandoned the family when King was three years old, and his mother remarried -- King was raised on a farm near Kingston, Ontario until he was ten years old, when a fire destroyed their home, after which he lived with relatives in Ottawa. He got his first guitar from his mother when he was seven years old and quickly developed a love of country music, most notably the work of Hank Williams. 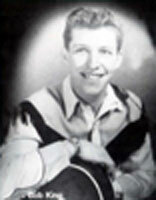 His other idols included Canadian country stars Hank Snow and Wilf Carter (aka Montana Slim). He was winning local music contests by the time he was 14 years old, and had his heart set on a career in country music. He left school to take a job in an Ottawa department store, but he also assembled his first band, the Country Kings, around this same time. King also left home around this time, due in large part to his strained relationship with his stepfather. Luck turned his way at age 18, when the Country Kings caught the ear of a local disc jockey, who became their manager and got them on the air in early 1954, and later got King a gig on a radio station in the United States, on the Wheeling Jamboree on WWVA out of Wheeling, WV. He was only on the Jamboree for a few months before homesickness brought him back to Canada. His good luck continued, as King was signed as the lead singer for a group called the Happy Wanderers, who were employed by radio station CFRA, the leading country music broadcast conduit in Canada. In addition to his performances on-stage in personal appearances with the Wanderers, not only in Canada but northern New York State just over the border, King served as a host and disc jockey, and played backup to visiting American country singers such as Johnny Cash and Marty Robbins. This activity led to a contract with Canadian RCA, and his first push toward international stardom. A handful of singles, including "Let's Make a Fair Trade," "Laurel Lee," and "Rockin' Jukebox" each made a good run up the Canadian charts and seemed poised to crack the U.S. market, but never did -- American RCA, which had been resistant for years even to releasing Hank Snow's sides south of the 49th parallel, seemed singularly uninterested in making even a token effort with King's music, despite the apparent interest from some deejays and promoters. 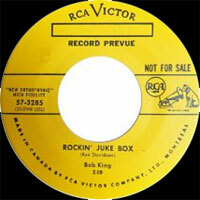 King left RCA in 1958 and moved to Rodeo Records, based in Halifax, Nova Scotia. The label continued to record him into the '60s, and he worked with the Happy Wanderers until they disbanded in 1967. With his wife Marie, King worked primarily in the Quebec province with the Family Brown, a large country ensemble, in which King sang covers of American country songs. Throughout the '60s, King was heavily influenced by American country and folk music. The husband-and-wife duo also played numerous smaller clubs in Quebec and northern Ontario, and they occasionally recorded together. King's health began to fail in the '80s, and he was diagnosed with lung cancer late in the decade. Bob King's recordings showed the influence of everyone from Jimmie Rodgers to Flatt & Scruggs. His covers include songs associated with Eddy Arnold and Hank Williams, but he also acquired songs by way of Wilf Carter, with whom he toured many times. His recordings have a distinct flavor all their own, however, regardless of whether they are hits of his own of covers of others' songs. He is deceased in 1989. 10th Anniversary - The Cowboy / Rose Of Old Pawnee / Little Tom / Jimmy Brown The Newsboy / All Canadian Boy / French Canadian Girl / Boy With A Future / Bluest Man In Town / Lonely City Park / No Parking Here / Give My Love To Rose / Hey, Honey!